The theme for this week's Mommy Moment is "That's my favorite" where you can post photos of your children with their favorites. The blanket that EJ was using as a pillow Was Rylie's baby blanket. EJ can't sleep without it. We have to bring it everywhere we go or else he wont be able to sleep. 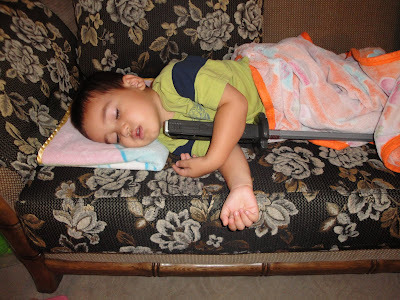 His most favorite toy is the sword, he also sleeps with it hehehe. The set of outfit that Rylie is wearing in this picture is her favorite. She wants to wear it everyday. EJ's favorite style of fashion when we were in PI (shirt-less) and favorite past time (digging the sand). 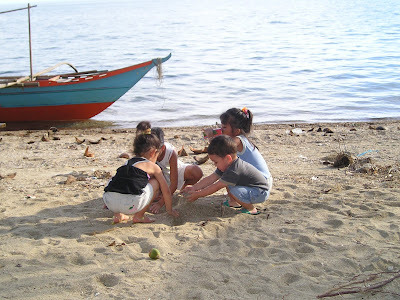 Their favorite past time in the Philippines. Their favorite cousins and playmate in the Philippines, my late brother's daughters Yami and Bhim. EJ's favorite bonding with Mommy when he was an infant. Daddy's favorite picture with EJ. Her favorite pony in our basement, her Tita Chris gave this to her. Favorite bonding with Daddy during winter time, riding a sled. This is her favorite care bear stuff toy. I have so many more photos of their favorites but I am tired of digging into our photo archives lol. Thanks a lot for coming by folks, your visits are always highly appreciated.